I would like to do what I had also meant to do right after the event which was to thank you for the brilliant services provided!! Your prompt communication, made it really easy to deal with and hence pick you as the caterers. I really, truly appreciated Aaron being so flexible on the phone if a last minute location had to occur, due to rain, which it did. In the middle of a stressful situation of having to organise this surprise event, your calmness was magic!! Then on the actual day and time, Nigel walked in to our house in the middle of the pouring day (the only day that it rained like this in February, lucky us), and again, he was so calm and collected, it was contagious!! Thank you Nigel, you made our night! 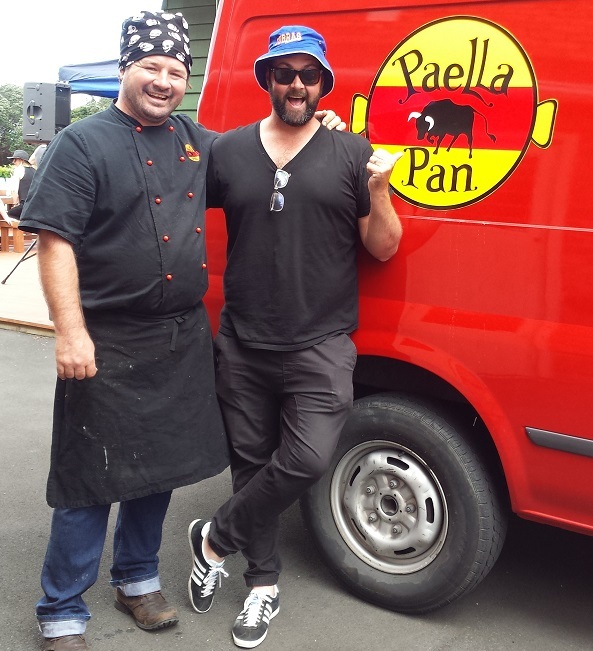 Paella Pan, pretty much did 60 % of our event, as it was meant to be at the beach ended up being in a small untidy carport, but once Nigel started cooking the Paella, everyone forgot about the rain and were completely enchanted by the smells and watching it been done on site!. Needless to say it was absolutely delicious and what a great idea to do the take away boxes for the special guests!! So thank you so very much, I feel 100% satisfied with Paella Pan and I am so grateful for the beautiful Paella and for the calming manner in which you, and Nigel handled this very rained out beach party, and helped us have a fantastic evening!! Your food and the special spirit you both brought was really great and our guests have been overwhelming with their positive comments. Thank you both so much for contributing so much to our special day. We have some great photos of you both that we will send. Again our many thanks. Thank you both so much for yesterday. We loved the Paella, it was so delicious and the staff are all raving. Thank you once again. Hopefully we can eat the paella again soon. The food was delicious everyone loved it!!! Thank you so much for taking our last min order. I just want to thank you and your team for a wonderful party last Friday. The food was amazing and everyone had a wonderful evening. Nigel and Nouria were fabulous and charming, please thank them for all their hard work. The Paella was a hit at my wedding The crowd was definitely impressed!! I can't thank you guys enough! The boys who helped out really did a great job with pack down as well! Will definitely recommend u guys to my friends! Fantastic service once again, so thank you! We were telling the in-laws about our plan to have you guys cater our wedding and they both couldn't stop raving about both the food and your presentation! We will just pop into the French Markets next Sunday to try them for piece of mind. This is just a short email to thank you for the wonderful food provided at our gathering on Saturday at Muriwai. We just wanted to say a big thank you as everyone enjoyed the catering you provided. The food was delicious, very well presented and on time. I wouldn’t hesitate to recommend your Company for any function. Yes, everything went extremely well. Thank you very much. It was delivered on time and very courteously. The food was delicious and thoroughly enjoyed by all. Most successful. I have now become a loyal and future client. Definitely use your services again. Thank you very much for delivering the Paella on Saturday. It was delicious and everyone really enjoyed it. The Paella's were fantastic and everyone commented on how much they enjoyed them. Nigel was also excellent. Thank you also for accommodating our dietary requirements. The paella was amazing, we will definitely use you guys again. Only problem was way too much so we are having a second fiesta today in the office!! Thanks very much for hosting the event it was great meeting you all. 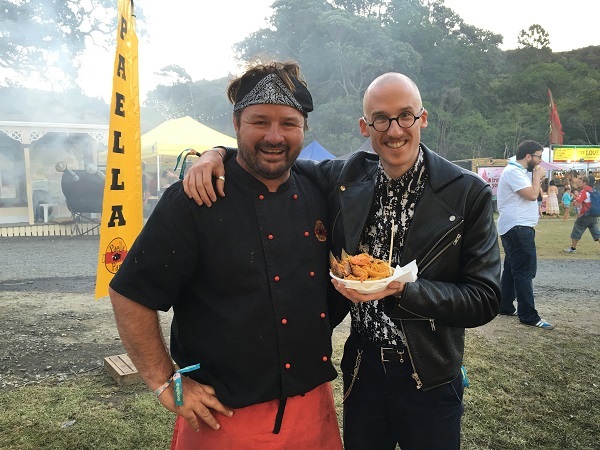 Peter and I really enjoyed the food and it was great to know that we can truly trust the quality of food that will be served at the event. The staff all were raving about the food after the party. It was excellent. Thank you again! Your service was professional and the food was delicious. Everyone enjoyed it. We were so incredibly happy with your gorgeous food. A huge thank you to you and your team!! Please pass on our sincere thanks to the 3 helpers you sent to our wedding - we really appreciated it, as well as you guys for organising everything to go smoothly. We will highly recommend you. Thank you I really enjoyed the night everything was amazing!! The guy who was cooking suggested I enquire about any deal or discount you could do for me because I allowed you to cook two other deliveries on site, perhaps free tapas or any discount would be great. Let me know, I will definitely be recommending you service to everyone I know and I handed out business cards at my party too. Thanks a lot for making our function enjoyable. Thank you so much for the INCREDIBLE Paellas, Churros, Sangrias and the amazing, warm incredible service by your staff. Everyone at our wedding said it's the best food by far they've had at a wedding, someone even said best food full stop! I'm also amazed at how you catered to a lot of dietary requirements without compromising on taste. Usually they say the bride never gets to eat their own wedding food and I had plateful of seconds here. Thanks for making our wedding so much more special! A lot of family are already requesting details about you guys. Thank you so much for Saturday, my Whanau and friends thoroughly enjoyed the day been my 50th birthday with a surprise Wedding. Thank you so so much for coming to cater our wedding. Your food was so delicious and was a real hit with our guests. The fact that you cooked onsite really added to the atmosphere of the party, the smells and visual appeal was awesome. You were super friendly and helpful, we loved having you here and hope you enjoyed your time in our neck of the woods. Looking forward to our next excuse to have a party so we can have you back again! We had to pay your account in two parts sorry, our online banking was being silly. Paella was delicious, the Paella Pan crew that cooked and served were awesome, and we had very positive feedback thanks. It certainly made my life easy! We would definitely use you again, and wouldn't hesitate to recommend you to others. Timing ended up being perfect too, and although we had reasonable queues to get to the food, they got through them quickly. Awesome lunch, staff were very appreciative. Thank you very much for all your hard work on Saturday - everyone loved it. I would like to thank you all very much for your wonderful food and service. Everyone really enjoyed the whole evening and I am sure it will lead to further business through word of mouth. 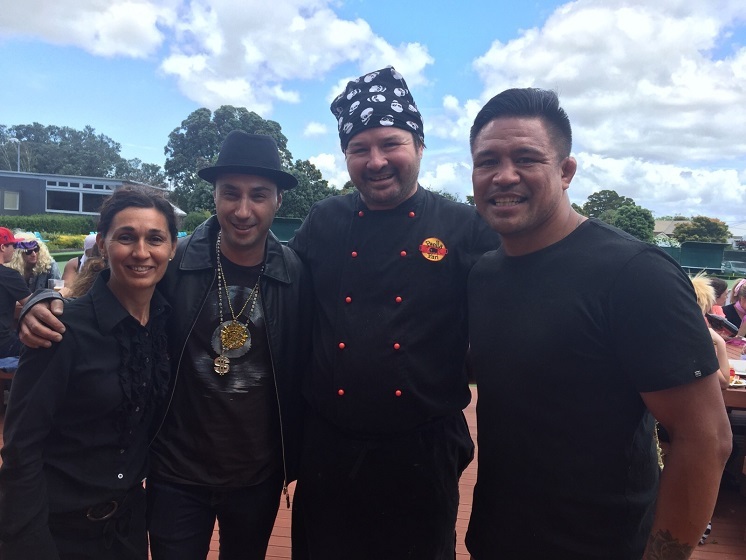 The food was delicious and Oscar and Joanna did a brilliant job serving your wonderful food. Thank you very much, I was extremely happy with everything. Fabulous food and very polite staff. Thank you so much for making my party terrific. Thank you for great food on the night.